Upton JFC is proud to announce that they are the 2017 recipients of the Cheshire FA Charter Standard Community Club of the Year award. 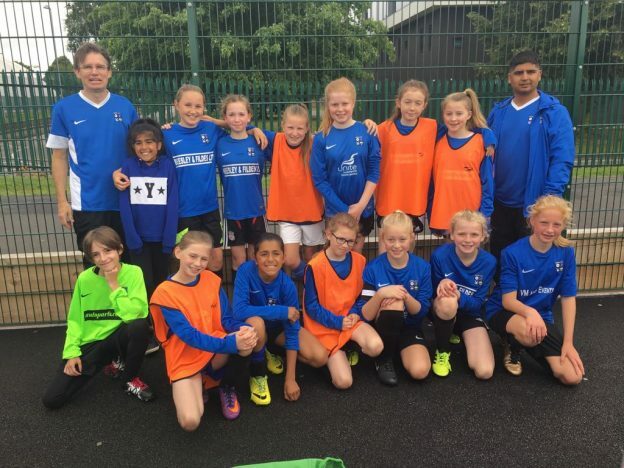 The club prides itself on its inclusive philosophy and endeavours to provide football for all; this has been demonstrated this season with the development of girls’ football training, and the inclusion of a new Open Age team and the well-established Vets team in the Chester & Wirral League. 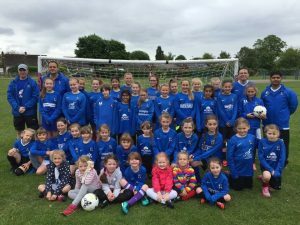 These initiatives have proved very successful, with over 50 girls now training each week, and teams preparing to play competitively in the Cheshire Girls League next season. 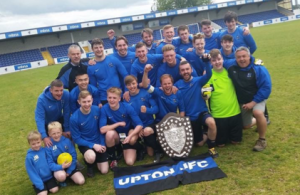 Additionally, there was success for the Open Age team in winning the Cayzer Shield, a match played at the Chester FC stadium. Upton Girls at the penalty shoot-out fundraising for the Club. Many thanks to Manleys solicitors for their very generous kit sponsorship for next season. The junior boys’ teams within the club, continue to go from strength to strength, with strong numbers in all age groups. There has also been great success this year, with the U10, U11, U12, U13, U14 and U15 teams all represented in Cup Finals. The U12’s winning the Knock Out Shield, while the very successful U14’s team won both the Eastham & District JFL Cup and the Chester & District Knock Out Cup. As Steve Stewart, Chief Executive Officer of Cheshire FA said, “the annual FA Community Awards presented by McDonald’s aim to recognise and reward the people and organisations that are driving grassroots football. Come along to our Annual Presentation Day and bring the family. Events start at 12pm and it will be an action packed afternoon with plenty of fun activities as well as the team presentations. Food, drinks and ice-creams will be available, or bring along your own picnic. Zorb Football – play football as you’ve never played it before in the large inflatable bubbles! Based on 12 players and 20 minute games there is a small charge of £3 for adults and £2 for children just to cover costs. Players must be over 11 years old. The ultimate test of skill, the Panna Football Cages offer a unique playing experience, with the aim of the game being to out-skill your opponent with goals and nutmegs. Games can either be played in a 1v1 or 2v2 format. The Inflatable Speed Shot Cage activity gives players the opportunity to put their shooting power to the test, with an Inflatable Tunnel & Speed Radar measuring the pace of shots in MPH, with scores displayed at the front of the activity. The SpeedShot Challenge is suitable for all ages.